Choosing Universal Windows to replace your windows and doors is a great way to increase the value of your home. While old windows with wooden frames need to be painted regularly, vinyl windows are maintenance-free. Service Area Includes: St Catharines, Welland, Niagara Falls, Grimsby and the surrounding localities. Increase the Value Of Your Home by installing premium quality windows and doors. Choosing Universal Windows to replace your windows and doors is a great way to increase the value of your home. In addition, with our Energy Star qualified windows, you will also save money on heating and air conditioning. As specialists in the installation of vinyl windows and exterior pre-hung doors, our competent installers have the skills to overcome many challenges encountered on the job. Working as a team, our reliable installers are dedicated to quality. Your free estimate includes an evaluation of your home that helps you choose the windows that are best suited for your house. Wooden window frames require hours of regular maintenance, painting and clean up. 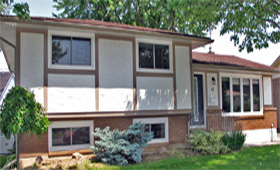 Vinyl windows are maintenance-free. 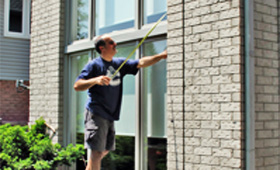 French Slider Tilt windows swing inwards without any lifting and makes cleaning windows easier than ever before.